Summer is slowly creeping back into almost every aspect of our lives—lighter foods, outdoor activities, vacations and of course craft beer! Brewers are designing craft beer summer seasonals to enjoy in warmer weather that pair well with summer foods and activities. 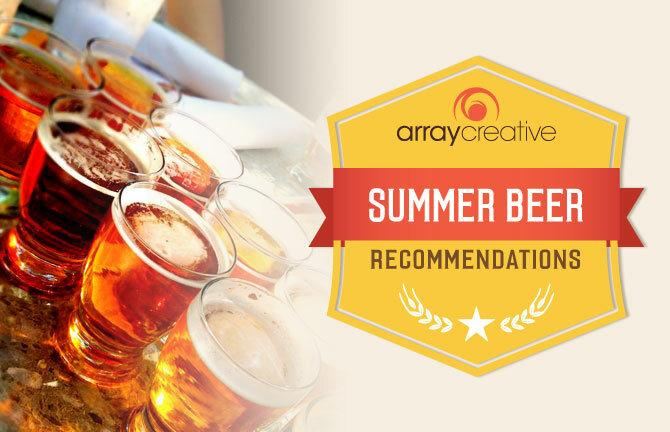 So naturally, we decided that it was high time for a summer beer tasting at Array! Below are 6 beer recommendations rated by the team in order of preference. So live a little, kick back and enjoy one of these brews (or several) this holiday weekend. CHEERS! A crisp unfiltered Kellerbier. This traditional Bavarian style originated from the small artisanal breweries of Franconia, where Kellerbier is still a favorite beverage in the local beer gardens. Crisp, golden, dry and incredibly drinkable lager, Summerfest has a delicate and complex malt flavor and spicy and floral hop character—the perfect warm weather beer. Hell or High Watermelon is an American wheat beer brewed with real watermelon, for a flavor that’s surprisingly crisp, dry and refreshing—summer in a can. Jack Straw is an easy drinking Pilsner that will wet your whistle on a hot summer day. This down-to-earth beer has a grainy sweetness, medium hop bitterness and country straw color.